But It’s Fun to Play With! Ahhhhhhh….. I just cracked open my can of Diet Coke. It sends an instant muscle tension release through my shoulders. I know a guy who keeps saying to me, “that stuff will kill ya!” Really? You think so? But the copious amounts of rum and cigarettes that YOU consume are perfectly fine? I know I am addicted. It’s not the caffeine I am addicted too. I get enough coffee in my day to take care of THAT addiction. I think it is the aspartame. I know it, I tried to kick the habit. Who are we kidding I half-heartily tried to kick the habit. I know it’s bad for my teeth, REALLY bad for my skin and who knows what it is doing to my insides. But after a very long day in the trenches, preceded by very little sleep, due to lots of reading for class, I am pretty sure I am not caring. I am not one of those people who is always worrying about healthy food or plenty of exercise. When people say “research shows…” I <insert hand gesture here>, roll my eyes and move on. Every week something new is bad for me. I live in Edmonton. The air I breathe is great most days, but the refineries contribute carcinogens to my daily intake. I figured I am doomed because of the refineries anyways, but my Great Grandma lived to the ripe old age of 98. She lived only blocks away from the refineries. I won’t eat processed food. Sausages, lunch meat, square cheese wrapped in plastic, Cheese that is spelled with a Z are all off my list. I eat fresh fruit and vegetables. I love Dairy, so butter is my spread of choice. To me Fresh is Best. In the olden days I use to can my own food, make my own jams and bake my own bread. I am better now, therapy helped out a lot. I still prefer it, but time is a huge factor. I think I need to move more and eat less, but what I eat isn’t a huge issue. I don’t have high cholesterol, and my blood pressure is fine. I don’t smoke and have a drink less then occasionally. Sure I talk big, I pretend to want scotch and a cigar, but never indulge. Chocolate and Coffee are a normal part of everyday life for MOST people, so I am not even going to worry about that. So that leaves me with one serious vice, Diet Coke. Yes I like the taste. Yes it makes me feel good and yes it is fun to play with. 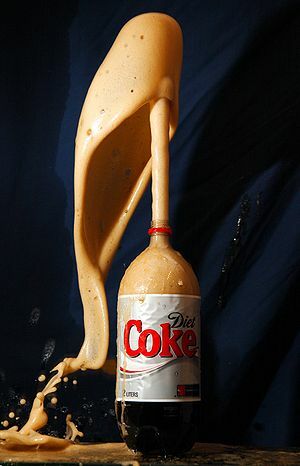 So as long as you don’t pop a mentos in your mouth when you’ve gulped a sip of diet coke, you’re all good, right? “I am pretty sure I am not caring”…..love it……can I borrow this?? Its going to be my new phrase in response to other peoples’ queries and comments into my life! I’m with you. I frequently just bat my eyelashes and say, “I think you’re confusing me with someone who cares.” My kids get sort of miffed by it but it works wonders when I’m feeling pressure put on by the outside world. Haha I use that on my kids too! Kindred moms unite! Thanks for stopping by! !